Deciding what and when to eat is an important part of our daily lives. Often our decisions are made by balancing rewards and costs. When we are on the prowl for lunch we often consider how far to go and the time it will take. Sometimes, the food in question is worth all the hassles, and on other days you might stick to an easier option. Animals also decide what and where to eat. For them these decisions can be very important: Choose the wrong place and you can put in a lot of effort for little or no food. Even worse, if you’re starving and encounter a predator you may not have enough energy to get away safely! However, some animals have found places were food is very abundant and there are very few predators. Cities and places where people gather often are full of food and come with the bonus of protection from larger predators that rarely visit these habitat types. Learning about how animals use human food can be very important. For example, animals that frequently consume human food may grow larger because of more access to food with less costs of hunting for prey. Also, substituting natural prey for human food can lead to an increase in prey abundance in natural habitats. Fig 1.1: White ibis eating using its long beak to grab and eat prey. Researchers chose four parks where the white ibis was regularly seen. At every park they counted the number of trash bins, and the number of people dumping food (dumpers) and walking by while eating (lunchers) during the lunch rush. They found that Belmore Park had overall more trash bins and dumpers, but Hyde Park had more lunchers. They also noticed that the white ibis frequented different parks on dry and rainy days. Researchers found that the park with the most human food (Belmore) also had the largest number of ibis (Fig. 2). However, on rainy days ibis were found less frequently in this park. Fig. 2: Number of white ibis at the four parks. Belmore, where human food was the most abundant also had a higher number of ibis. During rainy days, ibis were less abundant at Belmore. The researchers’ results suggest that ibis shifted their feeding decisions on rainy days to take advantage of abundant earthworms. Worms were not very abundant at Belmore Park (Fig. 3), where human food was plentiful, and during rainy days there were less ibis at this park (Fig. 2). 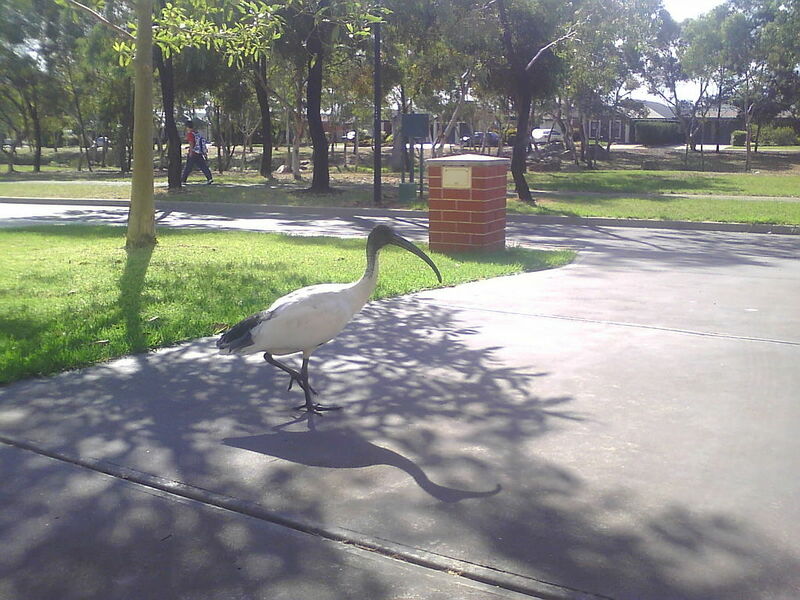 If white ibis prefer eating earthworms over human food, then maybe when it rains, ibis in Belmore would move to other parks where earthworms were more abundant (Fig. 3). However, we don’t know if the ibis decide where to eat when it rains because they prefer worms or because there are less people with food out in the rain. Fig. 3: The top panels shows that earthworms are more abundant during rainy weather. The bottom panel shows the number of earthworms at the different parks. Earthworms were found more at the Domain and less at Belmore park. Overall, I really liked the work done by the researchers. By standardizing the amount of human food, they were able to show data that suggests that human food is in an important factor for habitats used more by urban ibis. They also slowed that more natural habitats become more frequented by the birds when it rains. The fact that different habitat types seem to be important during different weather conditions highlights the importance of natural or green spaces within dense cities. The ability to move between different habitat types is likely important for the animals that live in cities.